Need That Car loves station wagons. 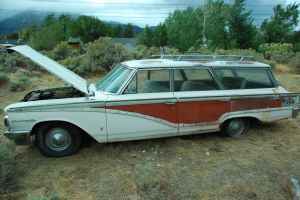 This 1963 Mercury Colony Park marks the first of a weekly series devoted to the station wagon. Perhaps this particular wagon is not the most auspicious beginning for a weekly series, but station wagons aren’t really auspicious cars, are they? Station wagons come into being as “depot hacks” – modified vehicles that could carry many people from train stations. Most wagons up through the 1940s were custom built with wooden bodies or body parts. As the U.S. auto industry moved into the 1950s, the full metal-bodied station wagon that we still know today came into being. Then came the 1960s – a veritable golden age of station wagons. Chrome, wood grain, roof racks, power accesories, third row seating, roof mounted windows (for cruising the vistas) and huge engines made station wagons the ultimate family utility vehicle. But, they weren’t cool. People didn’t collect them, fix them up, or love them. In fact, many people bought them for parts and scrapped the shells. So, to find a decent vintage wagon today can be a chore. This Mercury is certainly decent, and has all the right options to be a great restore project or a cool patina cruiser. It has a roof rack, it has three rows of seating, it has a Ford 390, and it has the all-important wood grain. According to the seller, it has been sitting for 30 years, so getting it on the road would take some real effort. 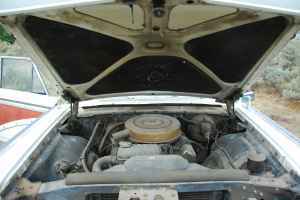 The good news is that Mercury cars of this era shared a chassis with their Ford counterparts, so parts should be readily available. This car is not exactly cherry, but it could be a great family truckster. 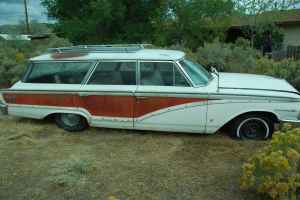 It is currently listed here on craigslist in Reno, Nevada for $3,000. The seller lists power steering, brakes, electric windows and seats, and original keys in his ad. This car’s potential is practically oozing out of its doors. NTC strongly suggests you buy this car. After it is sorted, swing by and take me for a ride. I’ll sit in the third row. This entry was posted in 1960s, Weekly Wagon. Bookmark the permalink. Station wagons are cool now that we’re 40. I sure didn’t want to drive one to high school! It’s all perspective! I’ll posit that wagons are now cool on their own. It’s not because we’re 40, it’s because minivans, SUVs, and now crossovers have taken over the title of “lame family car”. This leaves the station wagon to be appreciated sans stigma. I’m not 40 and I dig wagons. I blame that more on my taste for oddball vehicles.